I have really enjoyed Kelly Minter’s works. In fact, I have participated in a Bible study on The Fitting Room not once, but twice! She has an amazing way of writing that isn’t so deep that it gets lost in translation, but is spot on with the Word of God. She draws you in, encourages you to seek, learn, and grow. When I saw Kelly’s name come up in my email for a review team, I jumped on it! This beautiful journey through the Amazon invites readers to search their souls and follow Jesus wherever the river runs—experiencing the adventure of knowing the poor and forgotten people He loves. 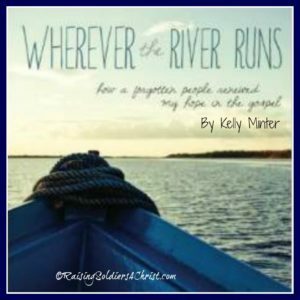 In Wherever the River Runs, Kelly Minter invites us on a jungle adventure down a river teeming with piranhas, caimans, a beautiful people, and, especially, God’s presence. Her honest and engaging narrative pulls back the curtain on one of the most captivating places on earth as well as on parts of the gospel we may be able to recite but have never fully believed. For anyone feeling complacent in their American Christianity, Kelly’s story of the forgotten people of the Amazon and how they transformed her understanding of the gospel, is sure to inspire. Some of us search to see God in our every day activities, while others look to find Him in unusual places. Sometimes we need to see God through the eyes of others to remind ourselves to look for Him throughout the community that we may have never expected to find Him. In this book, Kelly faces some challenges and is forced to confront areas of her life that needed much attention. Specifically, her pride, selfishness, and her unbelief. As she encountered the poor and less fortunate, she realized that God sees and does not forget those in need. After the completion of her trip, she was then faced with finding ways in her own community to help the needy. Kelly was forever changed by the “forgotten people” through their deep faith in God despite their circumstances. These dramatic events encouraged Kelly to draw closer to the Lord and laid the foundation to her servitude. Reading her story as someone whose husband is finishing up seminary, I am inspired to do more, to reach more, and to be more of what Christ calls me to do. Her story gives us renewed hope in the gospel. Come, be inspired, renew your hope!